One of America’s most famous twentieth-century artists, Raphael Soyer (1899-1987) was a leading advocate of Realism throughout his lengthy career. Russian born, he moved to the United States in 1912 when he was ten. His family settled in New York City. He sold newspapers and worked in a factory while pursuing art studies, first at The Cooper Union and subsequently at the National Academy of Design (now the National Academy Museum and School) as well as the Art Students League. A talented artist, he published his first original lithograph in 1917 and by the 1920s was showing his work in New York galleries. 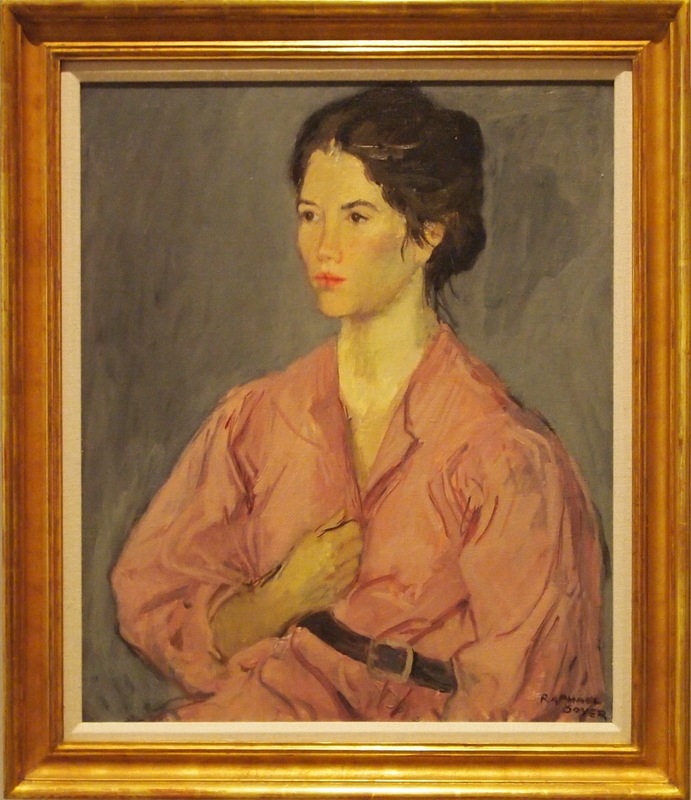 By the 1930s, Soyer already had made a name for himself as a Social Realist painter. He became known for his sympathetic portrayals of the downtrodden and the unemployed, whom he pictured in the gritty environs of Depression-era New York. Among his renderings of city dwellers are shop girls, seamstresses, milliners, and secretaries. The plight of the working woman caught Soyer’s imagination – and his eye. Towards the end of the 1920s, one-third of the American workforce was composed of women. By 1934, 25 percent of New York women were out of work. Soyer’s depictions are of ordinary, tired-looking women, pictured in their work environment, on city streets, or posed in the studio with props. Among the artists much admired by Soyer is Edgar Degas (1834-1917), who was a master of the studio-picture tradition. Degas’ oeuvre is populated with images of laundresses or ballerinas as well as of models he painted while they were bathing or at their toilettes. Soyer’s models were sometimes women he knew well. At other times, they were women he met on the street and brought into the studio. His relationship to them purportedly was always one of respect and friendship. Often shown in bare settings and engaged in intimate activity, Soyer’s female subjects show no awareness of a viewing presence. Their eyes averted, they are emotionally and physiologically distant. Their preoccupation with their own reflective thoughts lends a sense of brooding melancholy. 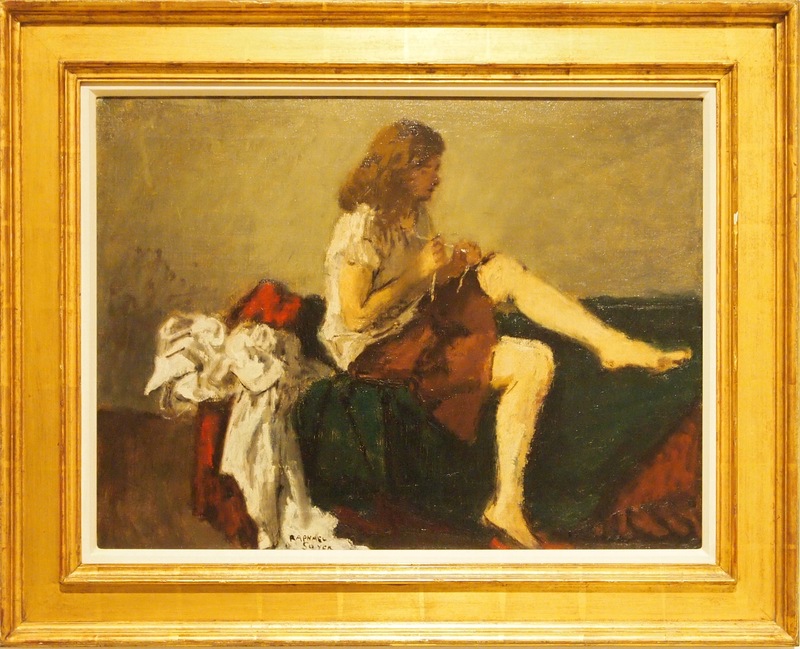 Women remained a favored subject throughout Soyer’s lengthy career. Borrowed from a private collection, the paintings on view are intimate portrayals of women painted at different intervals throughout his career. Raphael Soyer, "Girl with Necklace," 1945. Oil on canvas. Raphael Soyer, "Model in Pink Dress," 1979. Oil on canvas.